Barbeque to me had always meant large chunks of meat, be it steaks, ribs, chops or whole chickens, cooked over coals. So when we first moved to NC and hubby said he had a hankering for some good old NC bbq, I was unprepared for the chopped bit of pork served up on my plate. Here, this chopped up concoction is simplly called barbeque. When North Carolinians say barbeque, they are do not refer to the sauce slathered chunks of meat, they refer to the pork shoulder (or whole pig) slow cooked over coals that is then pulled or chopped fine and dressed with either a peppery vinegar dressing or a similar vinegar based tomato sauce. North Carolinians are very particular about their barbeque and most families will have their own version of the vinegar sauce ranging from bland to mouth puckering spiciness. I like the later version. If you would like to learn more about North Carolina Barbeque, start with this article. After my initial apprehension, ok so I wasn’t thrilled by the looks of this dish that has been sometimes described as something that has been chewed up and spit back out, I have learned to love this style of barbeque. As I chewed and let the flavors seep through my palate I realized this dish is very similar to a Filipino dish called sisig. Sisig is a regional specialty of the Pampanga region in the Philippines which refers to dishes that are infused with something sour be it from vinegar or other souring agents like citrus. Actually, NC barbeque is a much tamer version of sisig. NC barbeque utilizes meat high on the hog whereas sisig is more commonly known to utilize parts that are low on the hog; cheeks, nose ears, even intestines and internal organs. Listening to my husband’s stories about his family, I am reminded how this dish, in both cultures also encourage it’s consumption with one form of alcohol or another. 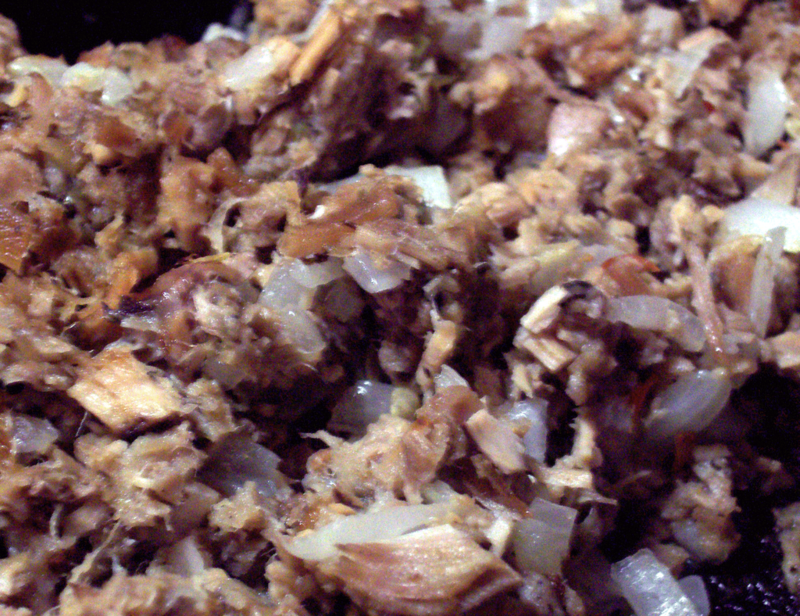 I remember my dad and his friends having sisig for “pulutan”. Pulutan is a term that describes anything that is snacked on while drinking. My husband has similar stories about his dad and grandfather doing the same thing while manning the barbeque pit. With its auspicious history on both sides of our family, it is of little wonder then that this dish has become a regular in Our Kitchen. Not to mention that is also a great way to re-hash leftover roast pork. Whether you chop your pork fine or like it in chunks, what makes this dish is the vinegar dressing. I happen to like mine with lots of spice so I always throw in at least a couple of freshly chopped hot peppers and when those are not available, I use dried pepper flakes. There is no set recipe, you just have to taste your way until you get the balance between vinegar, salt, pepper, peppers, onions, and any spices you desire, until you get it just right. When you do find the right combination, you will know for it is just like stradling the fine line between heaven and hell where it is heavenly and sinfully delicious at the same time. oops! 🙂 sorry about that…duh, I was wondering why the name you used was different! haha! on your way to your blog now….. The blog you visited is actually my friend’s blog, the one that actually led me to your blog. So you should not have a problem reading it! :0) Take a look, come visit me sometime!! I live in Cary, so we are actually pretty close!! It was nice to meet you, maybe we can see each other around some time! I like in Durham, not too far from you. I always come to Raleigh to shop at the oriental store. It would be great to meet up. Email me at jmomblogs-at-gmail.com. I enjoyed your blog, and saw this post about you mentioning living in NC. Well, I live in NC too! In what area are you in? I live near Raleigh! Come visit me, and if you live closer leave a comment in my blog, it is always nice to meet new people!! Hi Chas, that’s how my hubby eats his bbq/sisig sometimes. For breakfast, with eggs and fried rice 🙂 I love it with lots of chili too! Hi Lumpia, actually I don’t think I’ve ever had truly authentic sisig. So this will be one dish I will be on the look out for on our next trip to the Philippines. I have heard of several restaurants that claim to have the best. I can’t wait to try them! Yum! Sisig! I first had this a few years ago when visiting some cousins in Manila. Some local restaurants serve sisig, but alas, none has compared to what I’ve eaten in the Philippines. Thanks for the background on sisig. How interesting and unexpected…I like NC Carolina BBQ the best. The vinegar dip is the clincher…Pinoy talaga. Hmm I love sisig especially with egg on top and lots of chili! Good combination with beer! But anyways, I love barbecues as well! Hi Cusinero, the dishes really are very similar, and very doable at home. Their pig pickin’ here is very similar to our lechon. Only, instead of lechon sauce they chop their lechon up and put vinegar dressing on it. Hi Ces, thanks, you have a great week too! This is actually best when it is wood smoked and you get that natural smoky flavor. i’d love to taste this j! i love sisig and of course BBQ! have a great week! This dish does remind me of sisig or bopis (I love both). If I’m ever in North Carolina, I’d love to try this “authentic” BBQ.